Well, someone took a risk and it certainly paid off. How stunning is that lavender subway tile?? I don't think I have ever seen purple put to good use in a kitchen and I am a complete fan. I spotted this image over on Dear Heart DC (formerly known as Department of the Interior) - Jenn's images are always so soothing and lovely and the pop of color and quirk this one offered was too good not to share. Dear Heart DC and Aesthetic Oiseau - as well as several other DC-area blogs - shared a lovely recognition this past week! We were selected by Refinery29 DC as some of the top interior design bloggers (and pinners) in the Washington DC area. Thank you to Refinery29 as counting my blog among the great list - definitely was the highlight of my week! Hope you all have a lovely weekend...see you Monday! mmm, so delish! Love the look of that glossy subway tile! Love the eggplant AGA cooker! Congratulations on the recognition - it is well deserved. 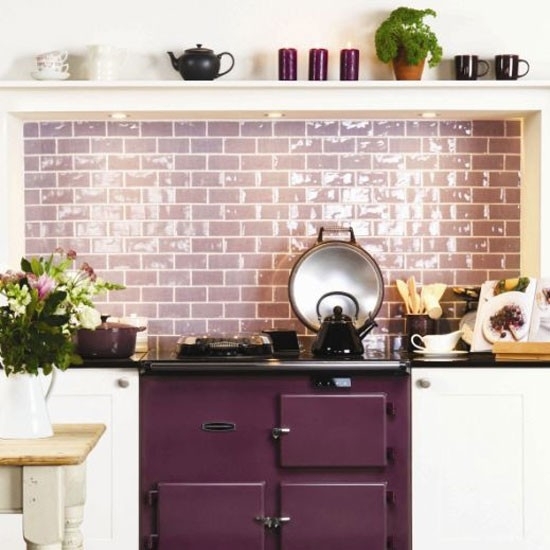 Have to say I love that tile and the stove, although I'd probably use yellow or navy in my home over purple. But, this picture is gorgeous enough to change my mind!